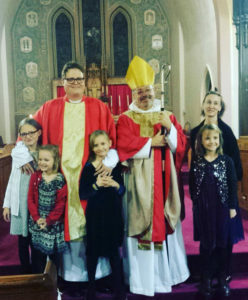 Father Dallman’s ordination to the priesthood with his family along with the Rt Rev. Daniel H. Martins, Bishop of Springfield. Father Matthew Dallman, Obl.S.B is the founder and publisher of Akenside Press. 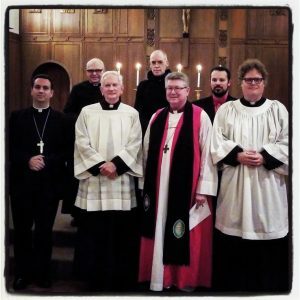 He is a student of the theology of Martin Thornton and the English School of Catholic spirituality (Anglican patrimony, properly understood), and he is an Anglican Parish Priest serving in the Episcopal Diocese of Springfield for the Parish of Tazewell County. He was ordained to the Deaconate on the Feast of Saint Barnabas 2016, and to the Priesthood on the Feast of Saint Lucy, 2016. Father Dallman is also an Oblate of Saint Benedict, having made his Final Act of Oblation on September 16, 2017, to the Saint Benet Biscop Chapter of Saint John’s Abbey in Collegeville, Minnesota. Father Dallman was born in metropolitan Washington DC but grew up in a northern suburb of Milwaukee, Wisconsin. Also a past resident of Saint Louis, Minneapolis, Saint Paul, Boston, and Brooklyn, he recently lived for thirteen years in Chicagoland before his call to Tazewell County in greater Peoria. He and his wife Hannah are the parents of four daughters and one son. Always involved in sports as a child and teenager, Matthew received a B.A. in English Literature with a minor in Creative Writing from Washington University in St Louis (May 1997). For three years he played football on WashU’s team. Father Dallman after making his Final Act of Oblation to the Saint Benet Biscop Chapter of Saint John’s Abbey. Also present are Bishop Steven Lopes (far left), Bishop Michael Smith (next to Fr Dallman), and Brother John-Bede Pauley (center). After pursuing a career of music performance and composition in his 20s and early 30s, the Holy Spirit called him to the Church and to the study of theology. 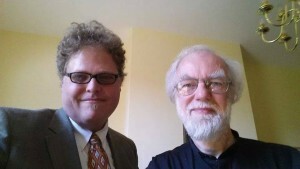 While a parishioner at Saint Paul’s, Riverside, near Chicago, where he was also a lay catechist, Dallman received a Master of Arts degree in Liturgical Ministry from Chicago’s Catholic Theological Union (May 2014) then a Master in Theological Studies degree in Ascetical Theology—with a thesis on the theology of Martin Thornton—from Wisconsin’s Nashotah House Theological Seminary (May 2015). Along the way, Father Dallman has been blessed by a number of excellent teachers. He has studied parochial theology with Fr Thomas Fraser, homiletics with Fr Richard Fragomeni, pastoral ministry with Fr Stephen Bevans, sacramental theology with Dr Richard McCarron, philosophical theology/ontology with Dr Herman Stark, and Ignatian spirituality with Thomas Heard. Previously, he studied English literature and poetry with Yusef Komunyakaa and Carter Revard, integral philosophy with Ken Wilber, and musical harmony with W.A. Mathieu. In the summer of 2014, Father Dallman spent a month in the United Kingdom in research and pilgrimage relating to his study of Martin Thornton’s theology. Funded through a Kickstarter campaign, he visited Oxford, Cambridge, Nottingham, and Hawarden (Wales). He met privately with Dr Rowan Williams, Sr Benedica Ward, Dr Alison Milbank, Dr George Westhaver, as well as with Monica Thornton (Martin’s wife) and the Rev. Magdalen Smith (Martin’s daughter). Monica Thornton gave Matthew permission to reissue all thirteen of her husband’s books—a tremendous honor. With Dr Rowan Williams, retired Archbishop of Canterbury, in his home at Magdalene College, Cambridge. 2 July 2014. It is Father Dallman’s strongly held view that Anglican spiritual and pastoral patrimony possesses an abundance of riches that derive from all eras of the Christian Church. Hence renewal of Catholic reality in Anglican parish life means studying its many examples of pastoral and ascetical synthesis, and learning how to use them in parish life rooted in prayer, catechesis, and obedience. To aid in that task, he founded Akenside Press as a means to make available catechetical, ascetical and theological resources that serve Catholic renewal and the English School of Catholic spirituality, one of the great schools of Catholic spirituality and itself the true Anglican patrimony.